From Jakku Spy to Trials on Tatooine to Vader VR. On 14 Sept. 2016 Diana Williams of the Lucasfilm storygroup spoke at TechCrunch Disrupt about ILMxLAB and VR at Lucasfilm. 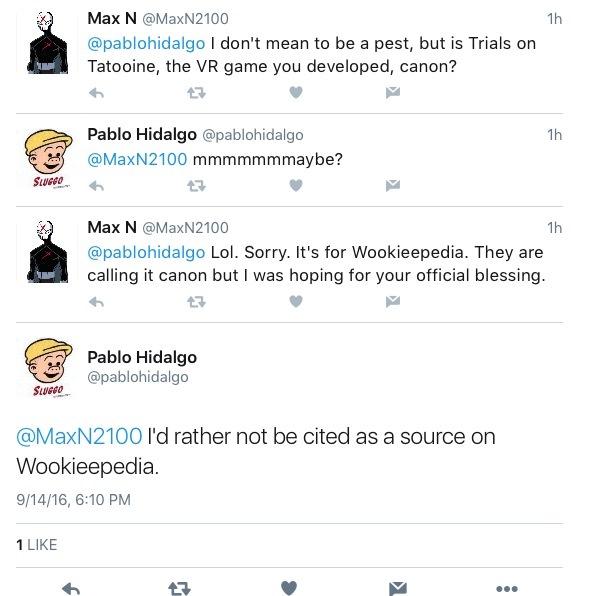 The info is all probably very similar to what was presented at SW celebration this year. But it is nice to see more of another storygroup member. I've always dismissed the VR projects as simply games, like Battlefront, but I'm beginning to wonder if they might have some real stories told in them, now. They talk about how they try to tell stories through the medium. And how it is something in between a game and a film. The storygroup members Diana and Pablo seem very tight lipped about all this. I've always been the first to dismiss the idea that Trials of Tatooine was about young Ben Solo. But now, I wonder if there still might be something canon about all the stories that will be told in VR. It is all very interesting, anyway.